Airlines can improve their conversion from clicks by as much as 25% by better matching landing pages to different types of trip profiles, according to a study. The study, from New York-based Intent Media, was conducted on behalf of multiple airline partners who advertise through Intent Media's Ads for Travel platform. The company declined to reveal the airlines. Several hypotheses on how to use existing landing pages to more effectively drive conversion were tested. 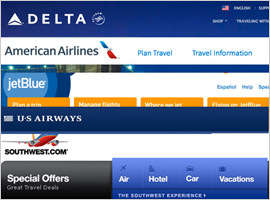 Ads for travel, which allow airlines to advertise directly in online travel agency search results, always link to a landing page matching the customer’s original search. But during the study, different landing page options were tested based on projected trip profiles. In one case, projected leisure trips were sent to a landing page that displayed flight options in a calendar format, allowing them to see fares both on and around their requested travel dates. This contrasted with the usual practice of serving a page that only displays itineraries for exact travel dates. Landing leisure travelers on the airlines’ calendar pages boosted conversion by 20% compared to a control group seeing the traditional results. “The beauty of this test is the airlines didn’t have to build a lot of new pages,” says Harris. “We used pages they already had. It was just a question of more intelligently deploying those pages." This is a good illustration of “de-averaging,” he says.